We welcome back leading saxophonist Derek Nash, a featured soloist with the Jools Holland Rhythm & Blues Orchestra, and his fabulous Latin/Salsa band to the Belvedere. 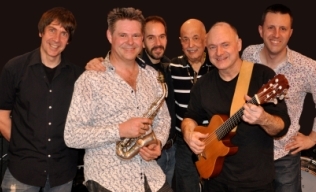 Co-founded with guitarist Dominic Ashworth, who was awarded Jazz Guitarist of the Year in 2006, they are joined by world-renowned, master percussionist and leader of King Salsa Robin Jones plus Marc Cecil, the drummer with King Salsa and other Latin bands. On the keyboards is Latin-maestro Neil Angilley who has previously appeared at the club with Julian Marc Stringle. This stellar line-up is completed by the bass of Andy Staples who plays and records with several leading UK bands.